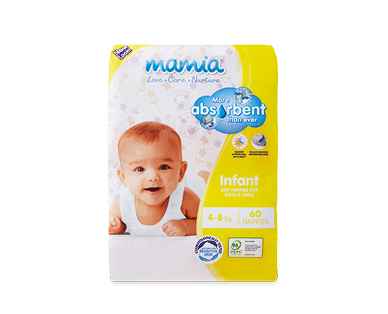 Infant nappies 4-8kg, 60 pack. MAMIA® Infant nappies feature a new active absorption core which has more super-absorbent pearls than ever before, keep's your baby's skin dry, even during long naps. Giving you peace of mind that your baby can have a restful sleep. MAMIA® Infant Nappies also have a soft and flexible elasticised waistband and wetness indicator that turns blue when wet, for more peace of mind.